Our final fighting game of Halloween is Marvel vs. Capcom: Infinite, which also just so happens to be the final review of October for SuperPhillip Central. Stay tuned for the October 2017 Review Round-Up tomorrow, by the way! 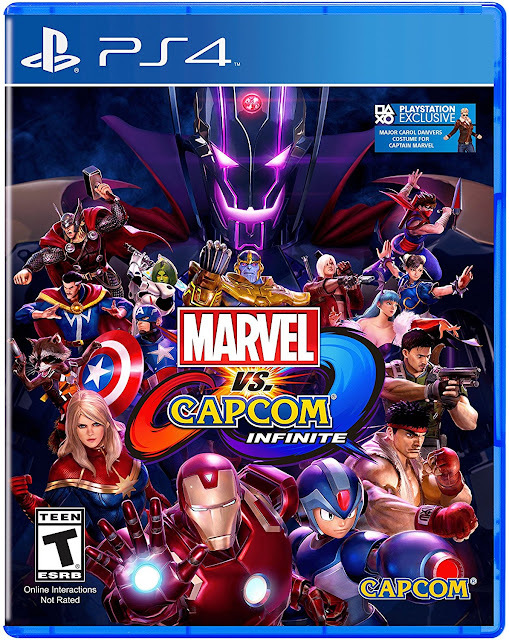 Here are my thoughts on the latest Marvel and Capcom fighting game crossover. The fate of two worlds depends on you. Of all of the fighting games that come out from Capcom, my favorite has to be the crossover ones between Capcom and other companies. I have a fondness for Tatsunoko vs. Capcom on the Wii, particularly. Now, a returning crossover sees a new game in its historic fighting game series, Marvel vs. Capcom: Infinite. From lackluster demos to bad impressions from the media, is there any chance for Infinite to actually be good? 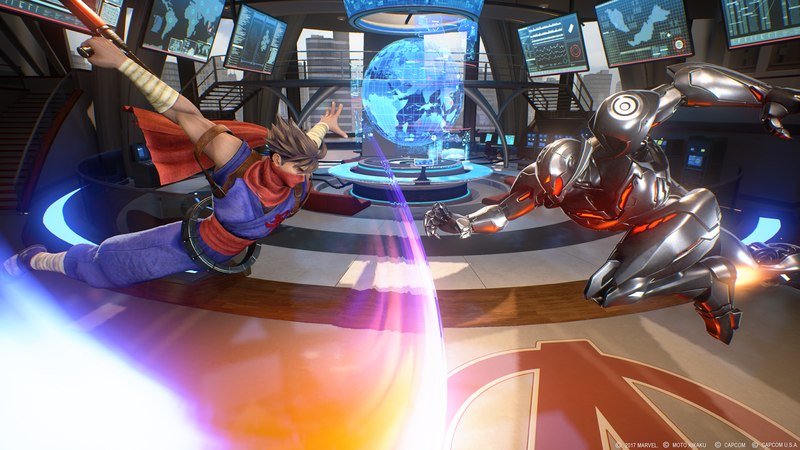 Compared to past Marvel vs. Capcom games, Infinite has a much slower pace to its fighting. This presents a more strategic flow to battle rather than the super fast and fluid fighting of the previous entries in the Marvel vs. Capcom series. However, a new system has been added to complement the slower style of combat in the form of the Infinity Stones, not-so-coincidentally a big part of the narrative in the most recent Marvel blockbuster films. Infinite moves from a 3 on 3 battle system to a 2 on 2 system. While the lack of an extra character to choose from for your team is a disappointing one, what it overall amounts to is giving you an added amount of strategy in choosing an Infinity Stone to equip to your team that will play well with their combat styles. These Infinity Stones augment abilities, restore health to characters, and more. Choosing which one to use for the given battle can be a stark difference between victory and defeat, especially if you're playing against a skilled opponent. After many cries and urges for his inclusion, Mega Man X is finally on a Marvel vs. Capcom roster. The controls of Infinite are relatively beginner-friendly, as each face button is assigned to a weak and strong attack, either a punch or a kick depending on the particular button pressed. All fighters have the same button combinations for attacks, which is also something nice and accessible for newbies. After all, Marvel vs. Capcom hasn't really been a friendly game for beginners compared to other fighting game franchises on the market. However, with all moves using simple button combos that are similar across all fighters, there's less necessity to remember different button configurations and more emphasis put on concocting killer combos. Setting up your opponent for a multiple hit combo is simple enough in easier difficulties, but as the challenge ramps up, you really need to learn how opponents will be impacted from your attacks so you can continue your combo in the right direction. Otherwise, you'll open yourself up to be attacked yourself. A great thing about Infinite is that while it's accessible to new players, there is a markedly deep game here for series veterans and those wanting more advanced tactics. The more involved combat tactics allow you to really get inside your mains and preferred fighters, coming up with pro-level strategies that a beginner could only dream of plotting out and performing. 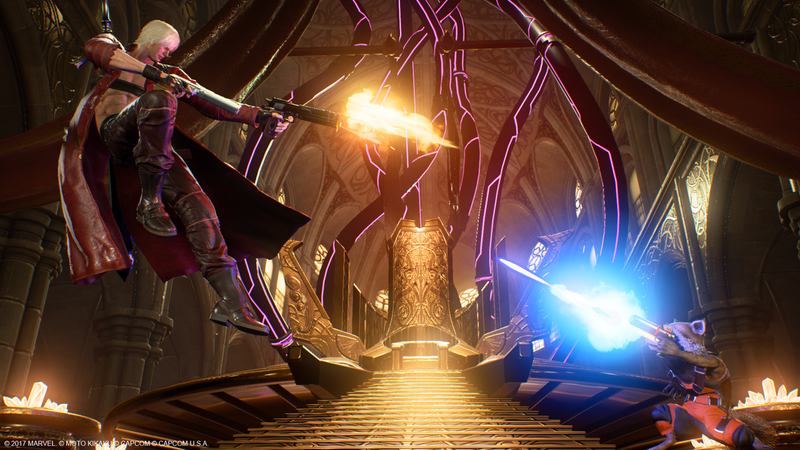 Thankfully, if you're not a seasoned vet, Marvel vs. Capcom: Infinite comes supplied with multiple modes to get into the fighting system before engaging in battles online, where no doubt most players' energy and time will be put in to. The most helpful of these modes is Training, where you learn the basics of battle and start out with simple button combos to use against an AI opponent. Each combo completed is a mission finished. You can learn the ins and outs of Infinite with some overview tutorials or do character-specific tutorials, teaching you the most pronounced and effective combos for that particular combatant. This is terrific for some deeper learning of and training with a fighter you might want to main. If you're a more casual player like myself, you might just want to check out the introductory set of tutorial missions for each character to get a taste of what's available, as these combos can get very complex with both the button combinations and specific timing windows required for them. Our two combatants zero in on one another for what is sure to be one exciting fight. 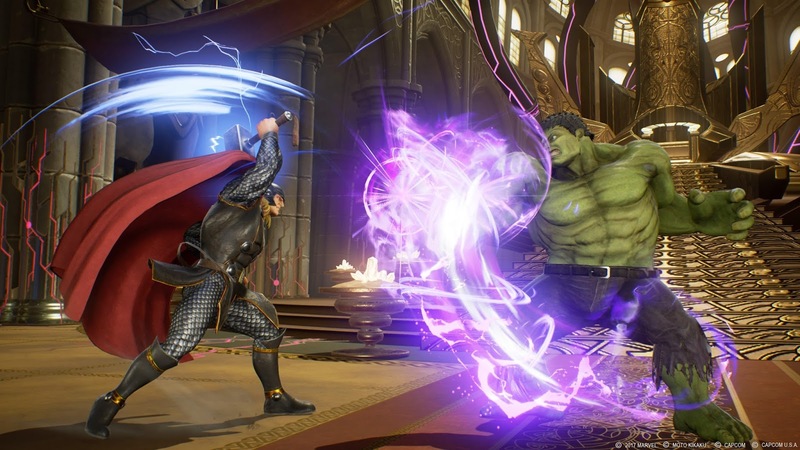 What Street Fighter V lacked when it originally released was a Story Mode, and Capcom seemed to have learned a lesson on this itself by including a mode within Marvel vs. Capcom: Infinite. Not much background is involved with the story to help players understand why folks in both Marvel and Capcom universes are together, but the story involves heroic forces made up of characters like Captain America, Iron Man, Thor, Mega Man X, Chris Redfield, and more taking on a new villain, a merge of Marvel's Ultron and Mega Man X's Sigma with the super powerful Ultron Sigma. After suffering a defeat by Ultron Sigma's hands, the resistance regroups and comes up with a plan to acquire the Infinity Stones, the only means to overcome their joint foe. The story itself isn't too engaging plot-wise, but what really saves it for me is all of the clever interactions and banter between both Marvel's heroes and Capcom's. Though the latter understandably doesn't have as much importance due to Marvel being a household name and Capcom... well, being Capcom. Still, when you get scenes involving Spider-Man, Resident Evil's Chris Redfield, Dead Rising's Frank West, and Final Fight's Mike Haggar exploring a subterranean area owned by the Umbrella Corporation, it's pretty cool to see. While the story won't last you long, maybe 3-4 hours for most players, it is worthwhile to play through once, but maybe not again. One of the biggest qualms many longtime fans of the Marvel vs. Capcom series have with Infinite is its roster selection, and I'm of the opinion that the complete roster has both pros and cons. To get the negatives out of the way, there are few completely new additions to the roster, as most are simply brought back from the previous game. Furthermore, a completely notable absence is that of the X-Men due to Marvel and Fox battling out rights for the characters, hence their exclusion in Infinite. It's still pretty lame to have a Marvel fighter without the likes of Wolverine, Magneto, and more included even if the legal situation is present. Thor's mighty hammer vs. the Hulk's powerful fist: Which will come out the victor? However, on the positive side, past Marvel vs. Capcom games had a lot of fighters that played similarly to one another. With Infinite, this issue is no longer pronounced at all. Each fighter presents their own combat style and combo potential without feeling samey compared to other additions on the roster. While the limitations on the Marvel side are disappointing, Capcom added enough of their own characters to make up for it decently enough. Of course, I expect more people would rather have the likes of Deadpool and Storm rather than the likes of Mega Man X and Darkstalkers' Jedah. Still, DLC is coming for those who want it, but the sickening part of that is that the characters of this first season were ready before Infinite even came to market, so your mileage may vary on if you feel it's worth supporting such a business practice. Moving on from roster-related disappointment to the disappointment seen in the visuals, Marvel vs. Capcom: Infinite does not continue the series' trend of impressive graphics. The backgrounds, though highly detailed, don't offer much visual engagement to the player, and especially the character models are a severe dislike to me, particularly the faces. Capcom already received a lot of flak for their interpretation of Street Fighter's Chun-Li, which was later remedied, but at the same time, the other characters' faces and expressions are a bit jarring at best. These type of faces make you wonder what is exactly off with them, which isn't a judgment I expected to ever say coming off brilliant looking entries like Marvel vs. Capcom 2 and then later on 3 and its Ultimate version. Even the music is less than stellar, offering ruined electronic versions of classic character theme songs. Overall, one can surmise that the budget for Infinite was unfortunately mightily toned down for this sequel. Dante and Rocket Raccoon go out guns blazing. Could it have ended any other way between these two? 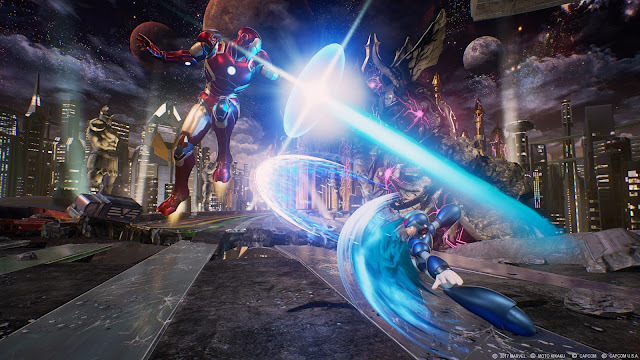 Marvel vs. Capcom: Infinite gets the most important piece of a fighting game right, the actual fighting. It's everything else that seems a bit sub-par. Sure, the Story Mode is fun to play through once merely for the interactions between Marvel and Capcom all-stars, but the budget put into that mode could have gone to make the whole of Infinite better, such as creating a more interesting roster. Still, the content is there for those who want it and online play runs as expected for those who will desire to be the very best, or just rage quit a lot. Whichever, right?